This caught my attention, seeing as how the leaders pay their taxes and the like drastically affects their cause. I’d just like to see how many other competitors will pull their percentage out the bag now, and if it will be the making or breaking of Romney. 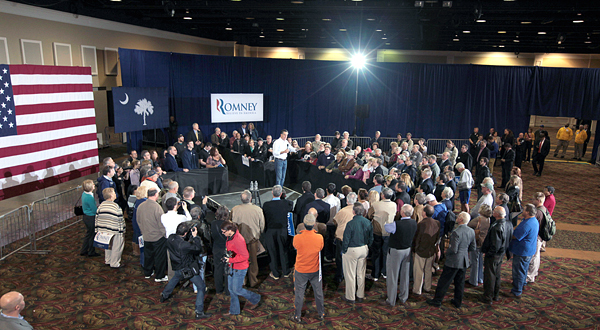 Mitt Romney held a rally at Florence Civic Center in Florence, S.C., on Tuesday. FLORENCE, S.C. — Under new pressure to release his tax returns,Mitt Romney on Tuesday acknowledged that he pays an effective tax rate of about 15 percent because so much of his fortune comes from past investments. The vast majority of the income Mr. Romney reported over 12 months in 2010 and ‘11 was dividends from investments, capital gains on mutual funds and his post-retirement share of profits and investment returns from Bain Capital, the firm he once led. And Mr. Romney also noted that he made hundreds of thousands of dollars from speaking engagements. Financial disclosure forms that candidates are required to file annually shows that Mr. Romney earned $374,327.62 in speakers’ fees from February of 2010 to February of 2011, at an average of $41,592 per speech. President Obama paid an effective federal tax rate of just over 26 percent on his 2010 returns, the most recent available. The disclosure is likely to cement Mr. Romney’s place as an unwilling figurehead in the intensifying national debate over taxation and income inequality. By his own admission, Mr. Romney ranks among the tiny percentage of very wealthy Americans who have benefitted enormously from a broad shift in federal tax policy that began in the 1990s and accelerated under President George W. Bush, in which income from investments began to be taxed at much lower levels than the wages and salaries that constitute most earnings for the vast majority of people. At the White House Tuesday, the president’s spokesman said Mr. Romney’s acknowledgement that he pays 15 percent reveals a basic unfairness in the tax code that Mr. Obama is concerned about.